Hello all! If you are following this blog, I’d like to let you know about our new website rootednutrition.ca! We will actually be shutting this blog down, as it has moved here. Check it out! Our new website offers much more, making it easier to register online for cooking classes, see the services we offer and learn more about us. You can also subscribe to the website here and be the first to know about upcoming events. As always, we can keep in touch with Facebook– an exciting cooking class contest to start soon! 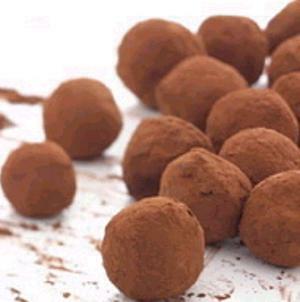 Check out our Raw chocolate truffles recipe! Antioxidants in raw chocolate are valuable in many different areas of health. It has been clinically proven raw chocolate reduces blood pressure. Raw chocolate reduces ‘bad’ LDL cholesterol and so has a positive effect on those with heart disease.It is also a powerful anti-inflammatory and so is helpful for revealing pain. Raw chocolate also packs a punch with feel-good phytochemicals, benefiting our mood! Our recipe is free of dairy and refined sugar and also keep well in the freezer (as if they’ll make it that far!) They are dense, so make them dainty and serve on sweets platters or make boxes of truffles, putting them in mini foil wrappers. Also, a reminder to check out our new website at rootednutrition.ca for more recipes! You can sign up for the RSS feed or newsletter for more updates! I’m pleased to announce the launch of the new website! Check out this press release with details! Over the past year, Rooted Nutrition has grown to now having a full curriculum of cooking classes every season. Our location is at radha (map) every weekend from 1-4pm. Check out the classes listed here. you can now sign up more easily than here on my blog. We’ll also have videos, recipes, nutrition articles and more! For all you subscribers out there; thanks for following us! You can subscribe to our monthly newsletters on the homepage of the new website at www.rootednutrition.ca! Or you can subscribe to our RSS feed in the top right of the new homepage. I’ll be keeping up on this blog periodically, but really just to nudge you over to the website. There’s a blog there too– and you can comment on it! I really want for our community of healthy foodies to have a forum to share recipes/info and such. You can shoot me questions there too. With Dairy and Cheese-making class filling up for this coming Sunday, we are about to wrap up a very successful autumn session of cooking classes! We are ready to repeat the classes for the winter session! I have been a bit lax about attending this blog because of the cooking class business and working on a new website. I’ll be announcing the launch on the new website hopefully by tomorrow! In the meanwhile, I’d like to send you to this page to check out the new lineup of class dates. You can still register online there too!I’ll also be offering gift certificates- think unique gift ideas! Healthy cooking classes in January-march have a focus on making and keeping healthy eating habits for vitality! Keep an eye on my facebook page for an exciting contest. We’ll be doing a cooking class giveaway in the near future. Last week marked the first meat class that I have ever taught! 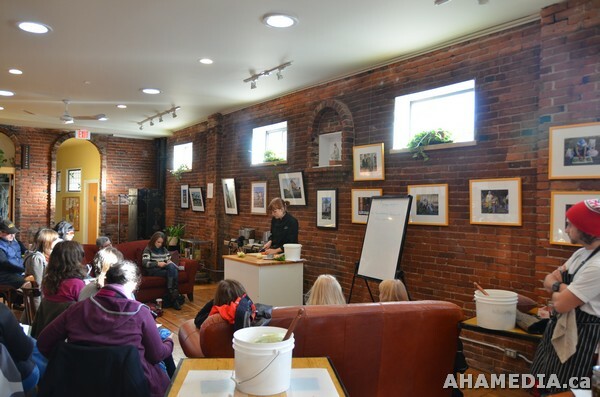 I started teaching healthy cooking classes while I was the Chef at a popular vegan restaurant in Vancouver. Of course while I was at work, I was planning vegan menus and teaching vegan classes, which really did help me to expand my repertoire, force me to think outside of my classical training bubble, and apply a lot of what I was learning at Holistic Nutrition school. All that said, I have never been vegan! I have tinkered with my diet in many ways over the years, but have never totally shunned meat. I have had many conversations with people of all sorts of opinions about the ethics and health aspects of eating meat. Like many others, I have learned about the conventional meat industry ( and having grown up on a conventional family farm with mostly pasture-fed cows, down the road from a gigantic industrial feedlot, I know that even within ‘conventional’ farming there is a huge difference in the treatment and health of the animals) and rather than choosing to opt out of it and boycott the industry, as is the motivation for many vegans and vegetarians, I am choosing to vote with my dollar by sourcing and eating better-raised animals. Don’t get me wrong, I respect the choice of the vegetarian or vegan, just as I respect the choice of a wise meat-eater. ( My friend and guest cooking class instructor, Cedana Bourne thinks that I should teach classes for ‘recovering vegetarians’, she herself being one of them!) As a holistic nutritionist, I counsel people on all sorts of diets, whether they choose what they eat on ethics or for health reasons. I think that eating some meat and especially making use of all of the animal can be environmentally responsible and healthy. I also believe that most people would benefit greatly from eating more plants. 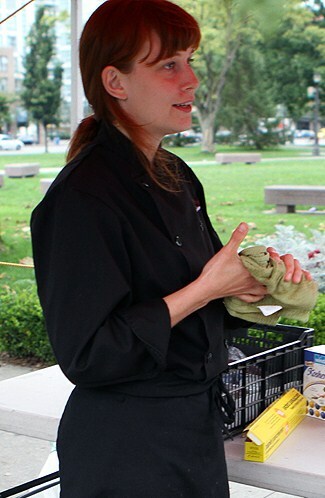 So most of my cooking classes are vegetarian, and many of them are sensitive to vegan or egg/dairy allergy diets. I apply what I have learned both from the Vegan Eatery as well as my skills from traditional culinary training to bring forth the skills that are imperative to maintain a healthy diet. Veganism being very ‘in’ right now, and having been intimately involved in the vegan food scene for years, I am aware that I may be ruffling some (faux) feathers here. There was even one longtime customer at the restaurant where I used to work who overheard me talking about eating eggs for breakfast and was severely hurt and disillusioned that I, the Chef of his favourite Eatery, creator of many seasonal, healthy and VEGAN recipes, eats EGGS! I didn’t have the heart to tell him that I also eat meat. He looked as if I had just told him that Santa Clause isn’t real. Come on! I have always been up front with the fact that I eat meat. Even in media interviews when I was representing my Vegan Eatery, I was never directly asked whether I am vegan or veggie. They just assumed, I suppose. ‘Taking Stock: making bone stocks and broths’ class went splendidly. We discussed ethical sourcing of meat and bones and the health benefits of eating bone broth. Aside from being super flavourful, homemade stocks made from bones have absorbable calcium and magnesium for healthy bones, beef broth contains iron and lots of gelatin. Gelatin, along with tendons and cartalige actually help us to maintain healthy joints and connective tissues! I shared traditional bone stock recipes and this Chicken Noodle Soup and Chicken stock recipe. Everyone knows that Chicken Noodle Soup cures the cold. (Jewish Grannies call it ‘Jewish Penicillin’!) I use gluten-free brown rice pad thai noodles, just breaking them up for spoon-friendly sized pieces. Leave them longer if you like to slurp them. I have stocked my freezer with gelatinous beef broth, tryptophan-happy turkey stock and salmon bone broth. I really feel like I am hunkered down and ready for winter now. Any number of healthy stews and soups practically make themselves with a nice stock on hand. Each harvest season people celebrate what Mother Earth has given them. They prepare the feast, gather together and eat it. The feast is to celebrate and give thanks for what has been received. I grew up eating family meal nearly every night. We had a big oval table with a mixed family of brothers and sisters and kid-friends and often neighrbourhood kids there too. The meals were not extravagant, but were always home-made and somehow there was always enough for everyone- even the last-minute drop-ins. If we were late to the table, Mom would yell ‘dinner’s getting cold!’ and we would unenthusiastically slump to the table. Wow- I had no idea how good I had it! When I went to friends houses, they often ate take-out or freezer meals. The Mom eating weight-watchers frozen dinner, kids eating pizza pops and dad going for the canned chili. Or they’d get take out; which embarrassingly, I was actually jealous of at a time! This meal was usually eaten at different times by different members of the family according to their schedule and preference, or it was eaten in front of the TV. Back then I did not realize that this simple routine of gathering together to eat the same food at the same time was a tradition worth fussing about. Back then I did not know that this simple act was a tradition that was already largely extinct. Flash forward a few years and I’m living on my own in the big city. The connectedness of family meal seemed a distant memory. Most everyone I know was eating dinner alone in their apartments, either at the computer, in front of the TV or ( ahhh!) from the pot in the kitchen. 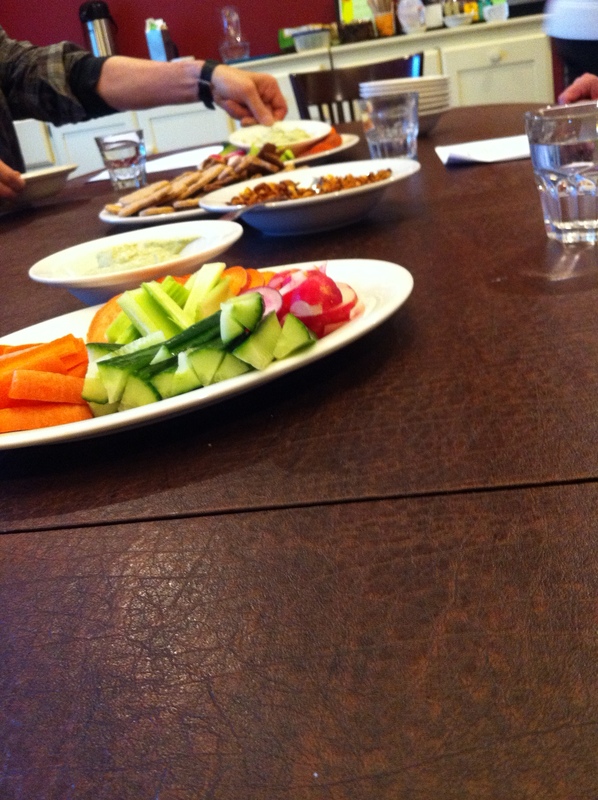 I craved a ‘normal’ community meal, everyone eating the same food created a united and warm atmosphere. We are having the same experience. Reflecting on our day, connecting; it’s the human–ness about the family meal that I was missing. First, I was no longer a kid, and not at the time in my life when having a brood of kids just so that I could sit down with a family at dinner was a good option either. Also, I worked most nights at the restaurant, or went to night school for nutrition. Dinner time was either scarfing food sitting on a bucket in the kitchen at work at 4:30pm or home after work or school at 11pm, making it tough to call friends and family over for a ‘normal’ meal. I started thinking about my city ‘family’ as being like an urban tribe. Right now the people who I see most often, confide in and know well are my co-workers and my friends. When I first started working at radha yoga and eatery as Chef, the staff were ordering off the menu and have their meal when they could find time. I brought forward the idea of eating together before service. At 4:30 every day, a cook (usually me because I loved making staff meal!) assembled all the food that was in excess or needed to get used into a crafty concoction like a stew, casserole, stir fry or whatever inspired us that day. ( Many of the dishes on radha’s menu were actually created based on staff meal favourites and happy accidents!) All the staff; dishwashers, servers, hostess, yoga teachers if present, cooks and office staff were invited. 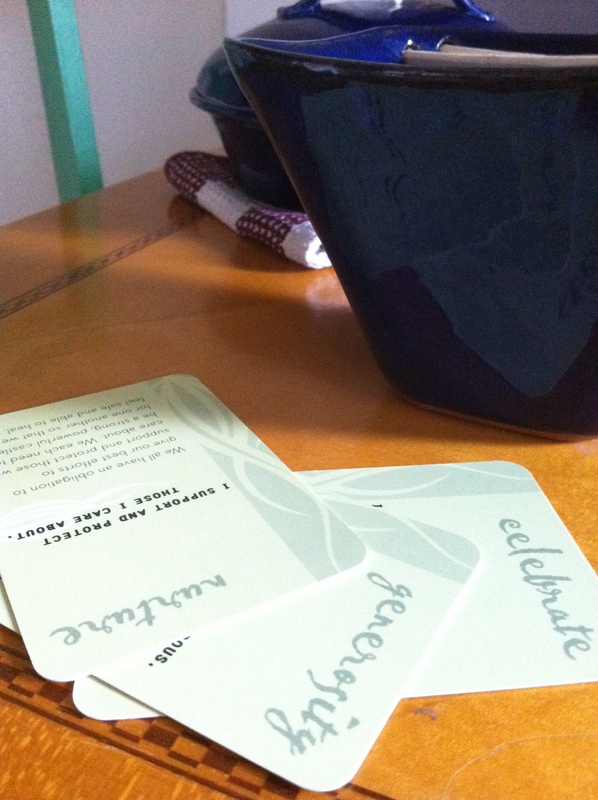 This tradition evolved to include ‘reflection cards’, simply a deck of cards with a word on them that each of us took a turn to reflect on the meaning of that word as it applies in our life right now. Our reflections allowed for us to really see the human-ness in each other. Routine tensions between the front and back staff were eased once we instituted the staff meal with reflections. Many studies show that families who eat together have healthier relationships and have better overall nutrition. We were finding that to be true around staff meal as well. When I finished working at radha to focus on Rooted Nutrition full-time, many of the staff expressed that their favourite times at work were around staff meal. For most of us, it was the only family meal that we had aside from maybe Thanksgiving and Christmas. These experiences with eating as a community have re-affirmed that teaching people to cook at home is my passion, not feeding people from a ‘have it your way’ type of menu in a restaurant atmosphere. We are well into the autumn session of cooking classes now, having completed Ancient Grains, Intro to Herbalism, Legumes, Gluten-free baking and moving on this weekend to Sourdough Baking part 1. Learning to cook healthy meals at home is an important first step to the family meal. My mission is to bring people powerfully back into their kitchens to prepare healthy meals with love! People often ask me whether I plan to open a restaurant. What I know about the power of sharing the experience of eating together makes conventional menu-writing kind of crazy-making. If I were to open a restaurant, the menu would be one option called ‘what’s for dinner’. I’d choose it based on what’s fresh,what’s abundant and what I feel the most love for making that day. It would be served at a long table, each person or group sharing family-style meals from communal bowls. Literally breaking bread together, passing the butter and reflecting about their days. I would be joining them in the meal that I made, completing the meal-making process with a warm bowl of food, good company and my daily reflection. This week I am going to be sharing a meal with my relatives for Thanksgiving. The conventional turkey may well be dry, the vegetables overcooked and the mashed potatoes sticky from over-mixing. But I know for sure that it will be nourishing on many levels because my grand parents made it with love and I will be benefiting from bonding with my community in the name of gratitude! Back away from that boring bagged lunch! We all know by now that it is FOOD that fuels us to learn, grow and think, right? The #1 reason that people tell me they are NOT eating healthy is that they eat lunch out everyday ( in staff or cafeterias, packaged sandwiches from coffee shops, pizza by the slice etc!). Making healthy choices in public IS difficult, especially with tempting cheap and fast food. Check out this article about ‘brain foods’ by the Best Online Colleges blog. Also check out my monthly newsletter. ‘Brown bagging’ your own lunch from home, packed with whole-foods inspired recipes does not have to be time-consuming or boring! Be the envy of your co-workers and classmates! The key to having healthy, vibrant and interesting lunches is to plan ahead and make salads that keep well in the fridge. Some healthy lunch recipes that are great to make ahead, keep well and use seasonal, autumn ingredients! 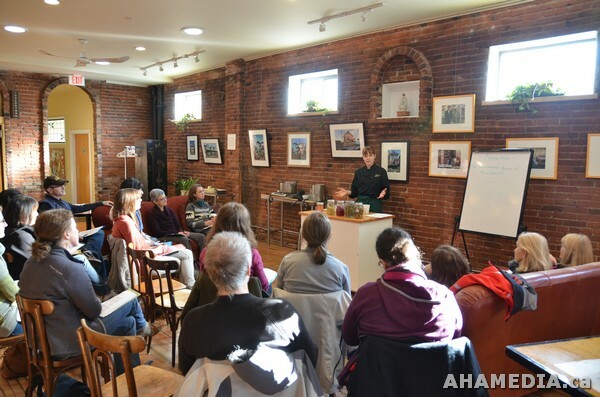 Speaking of learning and back to school I am pleased to announce the Autumn Session of Rooted Nutrition cooking classes, featuring 19 whole-foods cooking classes that will give you the techniques to confidently cook your way to health- deliciously! Rooted Nutrition has a New Website! For cooking class info, new blog and other info, check out rootednutrition.ca.